Down by the thickets of willows making their place where waters sometimes run (as a trickle or more.) This wayside is where the heart has its home, the air naturally cooling in this weave on a very hot day. I’ve been here “on the property” for a little over two weeks but clearly haven’t arrived until now. This is my first day here in the grasses, on their way to tall, the filtered light in nuances more than I can count, the old bowing willow branches remind me of the ever present inspiration to the eye of an artist, perhaps the other way around. To draw this place or just to be and see and be touched by this wild order? The kind of beauty that can go so easily unnoticed, much less the amazing feat of interspecies communing, even those without voices, but textures, color, integrity take me over. The air is not the only element that is renewed here. I want to say “on the other hand…” as I contemplate the contrast of the places that have been denuded (a stone’s throw from here) or stripped of their natural dignity by the use or appropriation for something we call “living our lives.” What I love about this wilder place by the draw behind the house is that life is already living here fully and I simply join in. This grand beingness of it all! It’s not that this place is any better than someplace else, it’s just that it is THIS place and can be no other place! And how so very different it feels here than just fifty or a hundred yards away. What a gift this place speaks of my own nature, which sometimes seems much less human than just Being alive, sentience itself, able to be touched, penetrated by the exquisite weave of interpenetrating life, of consciousness. The magpies have their squawk and the mourning doves their cooing calls. The breeze, now at my back, stirs the green life alive into motion and sound. Is it the motion of things that we hear or is it something just a bit more illusive than that? This up close visitation to the green of the thicket next to the seeping wallow brings me right to the taste of my own heart. They are not like the wider vistas of mountains in the distance with fields of sagebrush laying out before them, not like the open, open skies with all matter of clouds and blue in their ever-changing atmosphere-scape. Here things crowd in without any feeling of density or overbearingness. Here is intimacy, did I say that already, of brush and bower, of grass and twig, of every kind of insect and butterfly with the light ever shifting amongst it all. I become part of a nourishment cycle; bathing in spirit of thicket and this very place. 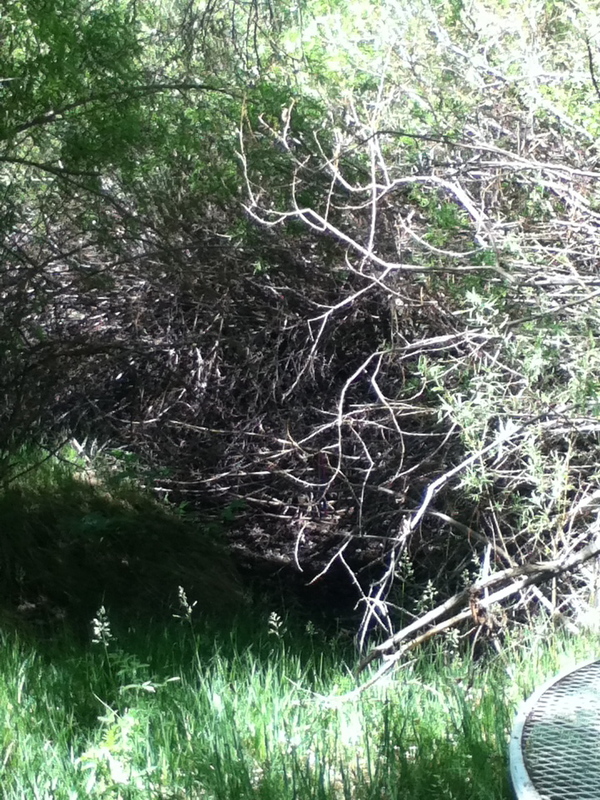 This entry was posted in nature, open, places/shelter and tagged consciousness, filtered light, grasses, light, New Mexico, photograph, place, poetical, praise, prose, San Cristobal, sentience, thicket, wallow, watercourse, writing on June 10, 2013 by janicesandeen.